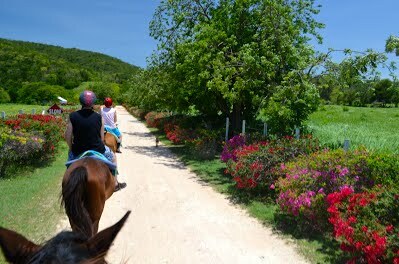 Your Montego Bay/Rosehall beach horseback ride n swim excursion continues to the gardens brimming with pimento trees, bougainvillea and fishtail palms. Lollygag with a cool drink in hand while you enjoy the sights of the hummingbirds gossiping with the orchids before your driver takes you to the next destination or back to your ship/resort. 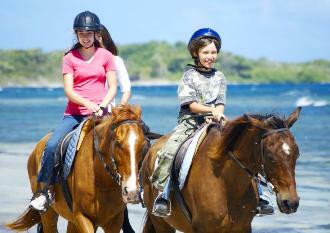 The horseback ride and swim was really fun .... we really liked it! Also, our driver was the best. He was so informative and so awesome to hang out with!! The service was excellent. We would definitely use your service again. 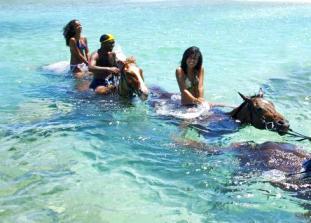 Our Beach Horseback Ride N Swim was fantastic! We had a wonderful time riding in the ocean. Great tour and value for money! Best tour we have ever done!!! Amazing! what a blast! Would highly recommend this tour for fun and a wonderful experience! Our cruise stop in Montego Bay JamaicaA for the day and we wanted to explore a little and at the same time have some fun. We found Jaital and was skeptic at first before booking. Our e-mails was answer promptly and we received our confirmation voucher quickly. Our driver was right on time. He was sociable and very friendly. He took us to our Beach Horseback Ride N Swim. It was fantastic! day well spent! We are happy that we found Jaital to take our fears away!!! Thank you Jaital team!